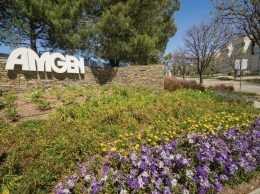 Thousand Oaks-based Amgen said a drug being developed in collaboration with Novartis showed promising results in providing relief for patients suffering from chronic migraines. The Phase 2 clinical trial met benchmarks for migraine reduction at two levels of dosage and with limited side effects. “Migraine is the sixth-leading cause of disability worldwide. Three to seven million Americans spend more than half of each month living with the debilitating symptoms of chronic migraine,” Amgen’s head of research, Sean Harper, said in a statement. “These positive results are exciting,” he added, because they support treatments with the new drug called erenumab. Phase 3 trial results will be announced later this year, he said. Patients experienced a 6.6-day reduction in monthly migraine days in each of the erenumab treatment levels and adverse events were reported in 5 percent or fewer patients treated. Erenumab is a fully human antibody that targets receptors which transmit signals that can trigger pain. By blocking the receptor signals, researchers believe they can prevent the onset of at least some migraine incidents. Amgen and Novartis launched a global neuroscience collaboration last year aimed at developing and commercializing drugs that could treat migraines and Alzheimer’s disease.